Cosmonauts Fyodor Yurchikhin and Alexander Misurkin completed a five-hour 58-minute spacewalk today, installing a camera-aiming platform on the hull of the International Space Station after engineers concluded it would work properly despite a misaligned attachment plate. 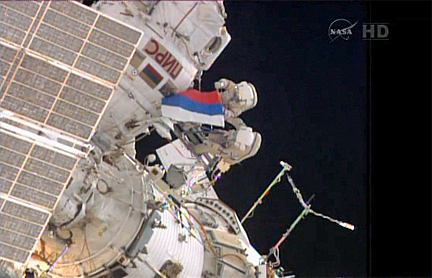 Just before floating back into the Pirs airlock module, Yurchikhin and Misurkin unfurled a red, white and blue Russian flag in the vacuum of space to mark Russian Flag Day, commemorating the raising of the current Russian flag over the Supreme Soviet building in Moscow in the wake of a failed coup in 1991. "It's a wonderful day. The people might think this is just a performance, that this was actually staged somewhere in the Moscow suburbs," Yurchikhin joked. "No, guys. This is space, as real as can be. Now we can see the flag of our motherland. "Congratulations to everyone on this, a day of Russia's flag. Please remember to value it and respect it. Then we'll be respecting ourselves and be respected by others." The cosmonauts then re-entered the Pirs airlock and closed the hatch at 1:32 p.m. EDT (GMT-4) to bring Russian EVA-35 to an end. This was the 173rd spacewalk devoted to station assembly and maintenance since construction began in 1998, the seventh so far this year, the eighth for Yurchikhin and the third for Misurkin. With today's EVA, Yurchikhin moved from 12th to 5th on the list of most experienced spacewalkers, with an accumulated total of 51 hours and 53 minutes. Overall, 112 astronauts and cosmonauts representing nine nations have now logged 1,088 hours and 49 minutes of station EVA time, or 45.4 days. The cosmonauts had four primary goals: to replace a laser communications experiment with a platform carrying a camera aiming system; to inspect six low-gain antennas to make sure protective covers were firmly in place; to collect particulate samples from the Poisk module; and to reposition a foot restraint for an upcoming spacewalk. They had no trouble removing the laser package, but when they tried to install the work platform/camera aiming system, they discovered the attachment plate was bolted on in the wrong orientation. After mulling the problem, flight controllers told the cosmonauts to take the assembly back to the airlock and to press on with other activities. But they eventually changed their minds, deciding the camera aiming mechanism could compensate for the incorrect orientation of the mounting plate. The cosmonauts retrieved the assembly from the airlock and installed it on the right side of the Zvezda command module as planned. Later this year, a Canadian company plans to launch a pair of cameras that will be mounted on the platform during a December spacewalk to beam back near realtime high-definition pictures of Earth to cell phones and other devices around the world. With the camera platform in place, Yurchikhin and Misurkin inspected the antenna covers, three at each end of the command module. During a spacewalk last week, one of six covers somehow came loose and floated away. During today's inspection, the cosmonauts discovered several loose covers, including one with missing screws. They tightened them up and worked through the rest of their checklist. The only task that did not get completed was repositioning a foot restraint needed for an upcoming spacewalk. That work will be done during a future EVA. After ordering cosmonauts Fyodor Yurchikhin and Alexander Misurkin to stop work to install a camera aiming system because of a mis-aligned attachment plate, Russian flight controllers told the cosmonauts to retrieve it from the Pirs airlock and to press ahead with its installation. NASA mission control commentator Pat Ryan said Russian engineers believe they can compensate for the misalignment by re-orienting the motorized camera aiming system, known as the bi-axial pointing platform, on command from the ground. "About 8:15 Houston time (9:15 a.m. EDT), mission control in Moscow instructed the spacewalkers to bring that hardware back inside, that that was the only option," said Pat Ryan, NASA's mission control commentator. "Apparently, though, it was not the only option and after further consideration, the Russian control team instructed Yurchikhin and Misurkin to go ahead and install that. "It is believed that it is misaligned, but it is only out of alignment in the yaw axis. That ... can be corrected mechanically after it is installed by maneuvering the bi-axial pointing platform. So the decision was made and the Russian spacewalkers have installed the EVA workstation ... on the starboard side of Zvezda." Two Russian spacewalkers were unable to attach a platform carrying a camera aiming system to the hull of the Zvezda command module, one of the primary goals of today's excursion outside the International Space Station. The mounting plate needed to secure the work platform to Zvezda apparently was bolted on in the wrong orientation. "They reported that when they got the base plate, the attach point, into the bracket where it would be secure, it was their impression that the work station was not oriented properly," NASA commentator Pat Ryan reported from NASA's mission control center. "The workstation is here ultimately to be a platform for, among other things, a couple of cameras for an optical telescope system. So if the support for those cameras was not pointed in the right direction, it could present an issue for that experiment." The experiment in question is a commercial venture by a Canadian company -- Urthecast (pronounced Earth-cast) -- that plans to launch a pair of cameras to the station later this year that will provide near real-time views of Earth to cell phones and other devices. The cameras were to be attached to the platform during a December spacewalk. Cosmonauts Fyodor Yurchikhin and Alexander Misurkin "tried to gauge whether or not it is technically feasible for them ... to loosen bolts or screws to rotate the base plate in a way that might get the work station pointed in the desired direction." But they were unable to re-orient the plate and flight controllers told the cosmonauts to call off the attempt. "Fyodor, Sasha, we only have one option, we are bringing it in," a flight controller radioed from the Russian mission control center. The cosmonauts then hauled the work platform and camera aiming system back to the Pirs airlock. The attachment plate presumably can be re-oriented using tools inside the station, but it's not yet known whether the platform's installation can be shoe-horned into a planned November spacewalk or how the delay might affect the Urthcast program. Yurchikhin and Misurkin, meanwhile, pressed on with an inspection of the covers protecting six low-gain antennas, three at each end of Zvezda, that are used by the navigation system of approaching European Space Agency ATV cargo ships. During a spacewalk last week, one cover somehow came loose and floated away and Russian engineers asked Yurchikhin and Misurkin to check the status of all the antennas. The remaining covers were seen to be in place, but several appeared to be loosely attached and at least one of them was missing two of four screws needed to hold the cover in place. Both cosmonauts worked together at the aft end of Zvezda to tighten up the covers. Of the three at the forward end of Zvezda, one cover was tightened up by Yurchikhin but two others have yet to be inspected. It is not yet clear how long the spacewalk might last given the cosmonauts were unable to install the work station/camera platform. Cosmonauts Fyodor Yurchikhin and Alexander Misurkin opened the hatch of the Pirs airlock compartment around 7:34 a.m. EDT (GMT-4) Thursday to officially begin a planned five-hour 39-minute spacewalk outside the International Space Station. The primary goals are to replace a laser communications package with an external camera platform; to collect particulate samples from the Poisk module's hull; and to inspect antenna covers on the back end of the Zvezda command module. An antenna cover somehow came off during a spacewalk last Friday and engineers want to verify the condition of the remaining covers. Both cosmonauts are wearing Russian spacesuits with blue markings. Yurchikhin wore a suit with red stripes during last Friday's spacewalk, but an apparent problem with that suit's primary coolant pump prompted mission managers to put that outfit on standby, pending additional troubleshooting, and to use a different suit today. For identification, Yurchikhin, call sign EV-1, is using NASA helmet cam No. 20 while Misurkin, EV-2, uses camera No. 17. This is the 173rd spacewalk devoted to station assembly and maintenance since construction began in 1998, the seventh so far this year, the eighth for Yurchikhin and the third for Misurkin. Assuming a full-duration EVA, Yurchikhin will move from 12th to 5th on the list of most experienced spacewalkers. Going into today's excursion, 112 astronauts and cosmonauts representing nine nations had logged 1,082 hours and 51 minutes of station EVA time, or 45.1 days. Misurkin was first out of the hatch, followed by Yurchikhin. After collecting tools and equipment, both cosmonauts planned to make their way up to the Zvezda command module and then back along the right side of the station where a laser communications package is mounted. The laser system was installed in 2011 and used to transmit high-speed data from Russian segment experiments back to Earth at up to 100 megabytes per second. After disconnecting the laser package, Yurchikhin and Misurkin plan to install a 54-pound work station known by the acronym VRM. The work station is equipped with a steerable 104-pound telescope/camera platform that can be controlled from the ground. A Canadian company, Urthecast (pronounced Earth-cast), is launching a pair of cameras on an upcoming Russian flight that will beam down high-definition Earth views to cell phones and other devices. 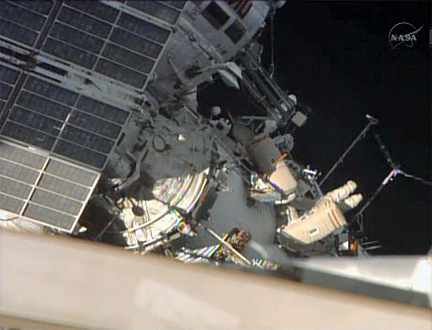 After connecting the camera platform to station power and data, Yurchikhin and Misurkin will temporarily stow the laser system on a Zvezda hand rail and then make their way to the back end of Zvezda to inspect three low-gain antennas. During last week's spacewalk, the station crew noticed an object floating away from the complex that Russian flight controllers later identified as an antenna cover. After inspecting the antennas, Yurchikhin and Misurkin will move the laser package back to Pirs, temporarily stowing it on an EVA ladder near the compartment's hatch. Then will then move aft again to inspect three more antennas. From there, they will make their way up to the Poisk module, attached to the upper side of Zvezda, pull back insulation and collect particulate samples from the hull. Then they will return to the camera platform and install a foot restraint needed during a spacewalk later this year to attach the cameras. With the foot restraint in place, the cosmonauts will return to Pirs, bring the laser experiment inside and call it a day.